On behalf of the United Nations system, may I start by thanking Your Excellency President Maithripala Sirisena for the kind invitation to speak today on this momentous occasion. I believe it signifies the strength of partnership that has been fostered between the United Nations and the Government over more than 60 years, and extensively re-affirmed throughout the last year. I was extremely privileged to have been present at the Oath Taking Ceremony at the Independence Monument this time last year. It was an event I will never forget – it was history in the making, a moment that captured the attention of the world community and inspired the hearts and minds of many. Seeing such a peaceful transition speaks to the resilience of the Sri Lankan people. In the one year since you took office, Sri Lanka has seen many changes, not least in terms of the political trajectory on which the country is set. You entered office this time last year Your Excellency, with a strong commitment to eliminate poverty, fight corruption, bring forward good governance, promote religious freedom, address the rising cost of living and strengthen relations with the international community. The UN Secretary General while congratulating Sri Lanka on the well-run elections, also noted Your Excellency, that on your shoulders rested an enormous responsibility. He spoke of the strong mandate given to you from the people, to lead Sri Lanka on a path of reform. He noted that this is a chance to advance accountability, reconciliation and to set the foundation for long-lasting peace, and build a society that is just and fair for all its citizens irrespective of ethnicity, caste religion, gender, age or sexual orientation. Indeed, this was the intention of both yourself and the Honorable Prime Minister Ranil Wickremesinghe, who have both expressed commitment to securing long term peace and reconciliation premised on principles of good governance while strengthening democratic institutions and ending impunity and inequality. On reconciliation in particular, in your speech on Independence Day (4 Feb) last year, it was humbling to hear you explain that the biggest challenge Sri Lanka faced, “is that of bringing together the minds of the people of the North and South, and through a process of reconciliation bringing about co-existence and national understanding”. It is addressing reconciliation challenges such as these that are at the centre of the UN Charter and its peacebuilding efforts. Your Government’s keenness to move forward on the reconciliation agenda and to define a pathway forward was clearly demonstrated, Your Excellency, when immediate steps were taken to initiate the release land previously under military control and return it to the original owners that had been living as IDPs for many years. This action, and the subsequent support for land clearance and re-activation of basic services, has begun to address some of the long standing core-grievance of the affected populations, and has given a clear signal that the Government of today represents all citizens of Sri Lanka, and is working to build a united and inclusive society. Your Excellency, a lot however remains to be done, and the UN along with the International Community is ready to continue supporting further resettlement and attainment of durable solutions as more land is released. The inclusiveness of the leadership’s approach was echoed very clearly in your remarks, Your Excellency, at the 70th session of the UN General Assembly last September in New York, where, in assuring the gathering of Sri Lanka’s commitment to achieve all 17 of the new Sustainable Development Goals by 2030, you went on to explain that Sri Lanka ‘will work towards the provision of basic needs of the people, progressive alleviation of poverty, elimination of all forms of discrimination and inequalities, and establish a society based on social justice and human security,”. Similarly, Sri Lanka’s determination to move forward quickly to fulfil your promises on good governance was demonstrated by the dedication of both yourself and the Honourable Prime Minister towards securing the 19th Amendment to the Constitution. This not only brought back Presidential term limits, but re-activated a Constitutional Council, thus returning independence to the various oversight Commissions. This enhanced the confidence of the Sri Lankan people in State’s ability to govern democratically, promote the rule of law and protect rights. The political transition then continued in 2015 when in August we witnessed the formation of a ‘National Unity Government’ for the first time in Sri Lanka’s history. The National Unity Government is setting an example of collaborative politics and its progress is thus being closely followed, including by the UN Secretary General. While there are obvious challenges, the hope is that the commitment behind addressing shared priorities, and reaching common goals will hold the coalition together. The Secretary-General in a statement issued yesterday, “congratulated you, your Excellency, and the Government and the people of Sri Lanka on the first year of the country’s political transition. He is encouraged by the Government’s commitment to a broad reform agenda that aims to realise durable peace, stability and prosperity for the Sri Lankan people. The Secretary-General acknowledges the initial steps the Government has taken to strengthen good governance, advance reconciliation and implement the resolution of the Human Rights Council of October 2015. He urges continued progress in these areas and emphasises the need for inclusive consultation processes to address issues of transitional justice. The Secretary-General in his statement noted that he supports the Government’s efforts to advance a nation-wide dialogue to achieve a long-term political settlement acceptable to all. In this regard, he welcomes the Government’s announcement to commence constitutional reform. He calls on all stakeholders to cooperate in a spirit of inclusion and good faith. Throughout this period of transformation, I would like to thank you for your Government’s comprehensive engagement with the United Nations system. Here in Sri Lanka, in New York and in Geneva, the last twelve months has been a period of intense collaboration, with open, frank and honest dialogue. From the policy level to the grass-roots, the UN system is proud to have been a working side by side with your Government on key development issues including those related to the ongoing recovery from the conflict; reduction of disparities in income, educational and health; addressing food security and eradication of malnutrition; the promotion of decent work and international labour standards; and strengthening the resilience of Sri Lanka’s vulnerable communities to climate change and natural disaster. The Government has engaged widely with the International Human Rights architecture, and it was encouraging, on the International Day of Human Rights, to see Sri Lanka sign the International Convention for the Protection of All Persons from Enforced Disappearance. It will now be important to move swiftly forward with ratifying the Convention and introducing national laws to criminalise enforced disappearances. The Government, under your leadership, Your Excellency, is also taking steps towards fulfilling Sri Lanka’s reporting obligations under several UN treaties. In 2015, it submitted a number of periodic reports, including the report due under the Convention on the Rights of the Child, which was prepared with the support of the UN. We look forward to continuing to support you to fulfill outstanding Treaty Obligations. 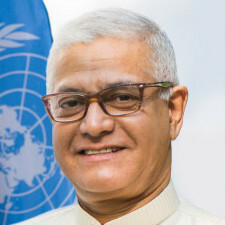 Throughout 2015 the Sri Lankan Government engaged in regular dialogue with the High Commissioner for Human Rights, participated in a number of proceedings with the UN Human Rights Council, and worked with Special Mandate Holders such as the Special Rapporteur on the promotion of truth, justice, reparation and guarantees of non-recurrences and the Working Group on Enforced or Involuntary Disappearances. Engagement with the UN Human Rights Council during 2015 was based on an approach of trust and cooperation that resulted in a historic co-sponsorship of the Resolution on ‘Promoting reconciliation, accountability and human rights in Sri Lanka’. There are now tremendous responsibilities bestowed on Sri Lanka through the Resolution, and the United Nations stands ready to continue supporting Sri Lanka to the maximum extent possible to move forward with these. The UN Secretary General has expressed in his dialogue with the leadership both after you took office last January and again after the Parliamentary elections, his firm commitment to support Sri Lanka’s peacebuilding and reconciliation efforts. Soon after you took office, the Secretary General requested the Under-Secretary General for Political Affairs to visit Sri Lanka at what he saw as ‘a moment of historic opportunity for the people of this beautiful country’. This laid the foundation for Peacebuilding support to Sri Lanka. In November last year, as a further assurance of the UN’s longer term commitment to secure peace, the Secretary General declared Sri Lanka eligible to access long term support from the UN’s Peacebuilding Fund. Your Excellency, the UN is now working closely with your Government to take forward peacebuilding initiatives to be supported by the Fund. A Peacebuilding Fund Board, led by the Government, is being established to guide and steer the identification of peace building priorities. – And, Governance Reforms to deepen democratic institutions and progress sustainablepeace. Under this framework, some high priority initiatives have already commenced during 2015. This includes quick-impact and catalytic support to the resettlement processes in the North and East, for example provision of shelter and sanitation facilities, support for livelihoods, and rehabilitation of productive assets – interventions that have together enabling IDP families to return to their land. It has also included technical assistance to the Ministry of Resettlement for the development of a Policy Framework on Durable Solutions for IDPs, Refugees and Returnees. In conclusion, let me once again express my sincere gratitude, Your Excellency, on behalf of the United Nations, for the invitation to speak today at this event marking the historic transition. For me personally, I have one week left serving as the UN Resident Coordinator and UNDP Resident Representative in Sri Lanka, before taking up a new assignment in New York, and I am truly honoured Your Excellency, that this occasion be one of my last official engagements. I have a very dedicated and experienced UN Country Team working here in Sri Lanka, and I can assure you that they will continue to do their very best to provide you with highest quality of technical and programmatic support. As we start 2016, I would like to wish you, the National Unity Government and the people of Sri Lanka every success as the country moves forward on the path as laid out by the leadership of this country. Where there is trust in the rule of law, and impunity is a distant memory. This is the Sri Lanka that I believe we are all invested in. *UN Resident Coordinator, Subinay Nandy’s statement at the President Maithripala Sirisena’s first year in office, on 8 January 2016 at BMICH, Colombo.